Such a great way to preserve the flavors of summer! 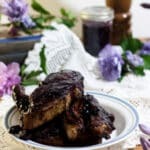 This Blueberry BBQ Sauce is great on chicken and pork! Sweet, tangy and smoky! So, you know that I love to try preserve as much of the flavors of Summer that I possibily can! It is such a long, dark, cold, damp winter here in Upstate NY (I could totally come up with more adjectives for our winters here, but I’ll refrain!)  Suffice it say, I am not a huge fan of our winters! To this end, preserving the summer flavors, that is, I try to can all of the fresh fruits and vegetables that I possibly have time for. This Blueberry BBQ Sauce is one of our favorites! It tastes like fresh blueberries with an attitude! When I developed this recipe, I envisioned it tasting better with poultry. Now don’t get me wrong, it’s awesome on chicken, but it is also great with pork! The method for canning this blueberry BBQ is basically identical to making jam, but no pectin is used. It will be shelf stable for about 1 year. Do you preserve fruits and veges too? Let me know what your favorite is! Thanks for stopping by today! Don’t forget to sign up to our mailing list so that you don’t miss any recipes! 2 tbsp chipotle juice plus 2 chipotle peppers from can of chipotle in adobo freeze any unused portion of the can for later use. Roast peppers directly on gas flames of stove, in a high grill, or under the broiler until skins are very black. Remove to plastic bowl and cover with lid or plastic wrap until cool enough to handle. With a paper towel, slip off blackened skin. place all of the ingredients in a large pot. Mix well, heat to boiling. Reduce heat to quick simmer. Simmer for 30 minutes to 45 minutes, until desired thickness is achieved. This looks absolutely divine! What a great way to use up blueberries. I can just imagine how delicious those ribs taste! Oh, they are so delicious! Thanks, Elaine! You could absolutely use frozen blueberries too! I’ve never canned barbecue sauce before, but I definitely want to try this! What a great way to preserver summer’s blueberries! Thanks, Pam! It is really easy to can BBQ sauce! You will love this one! wow now this is really innovative!! I’ve never seen a barbecue sauce ;like this before. sounds delicious! Thank you Camilla! It’s really super tasty! This is an absolute keeper in the sauce department! I can’t even imagine how delicious this tastes and am really looking forward to making it. I make a killer sliced seitan (vegan steak) and this would be perfect on it. Oh, great! I’m so glad you like it! Thanks for stopping by, Ginny! Homemade BBQ sauce is the best. The blueberries add the perfect amount of tartness. I agree! The blueberries give it lots of flavor! Thanks, Krissy! It has to be homemade bbq sauce. Adding blueberries to it is such a great idea. Thanks Dannii! I appreciate the comment! Blueberry and pork are a delicious combination. This recipe looks very tasty. I can’t wait to make it for my next cookout! I think you will like it! Thanks, Katie!! OH MY! Blueberry and bbq sauce is a perfect combination. I’d love to try this on so many things. I’m sure everyone would love it. It really is super on chicken too! Thanks for the comment Julie! Anything homemade is always best. This blueberry bbq sauce sounds delicious and perfect. I hope it must have an extra layer of flavour from blueberry. Love your creative way of using blueberries !!! Thank you so much, Geetha! That is very kind! What an interesting combo! I love BBQ sauce, I can’t wait to try this one! Thanks, Amanda! I think you will love it! Oh, my! Blueberry BBQ sauce… yes, please! It looks so thick and perfectly sticky the way a good BBQ sauce should be… can’r wait to try this. It really is thick and sticky! Great way to explain it! Thanks Catherine! I just had a long discussion with a frind of mine about freezing as many summer flavors as possible. Great sauce that will fit so many meat recipes any time of the year! I freeze everything that I can! It is so great to go to the freezer in February and make something that tastes like summer! Thank you Jacqui!